Our red sustainable interior lining is made from RPET (recycled PET bottles). This material guarantees durability and high build quality. Would we have impressed Jules Verne with centric-x ? One who came from the future to meet you in the now - centric-x . The extraordinary center zipper system turns out to be down-to-earth functionality and not a design game. The interplay of shades of gray in the waterproof outer material gives the centric-x liveliness and something mysterious. 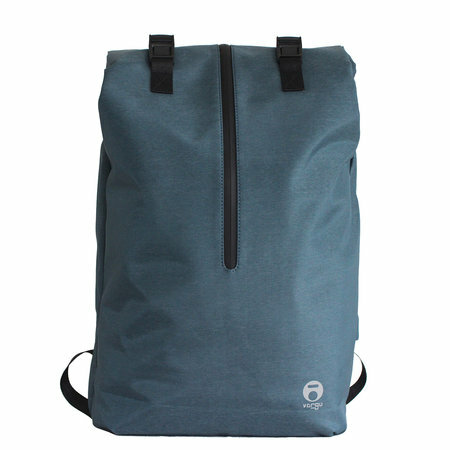 The roll top hides the closed zipper, adding anti-theft functionality to the backpack. So no point of interest for any thieves. Numerous sleeves and zippered pockets, a USB port for your power bank, a padded laptop compartment up to 15" and a 10.5" tablet compartment, offer you the tools you need for your digital future.